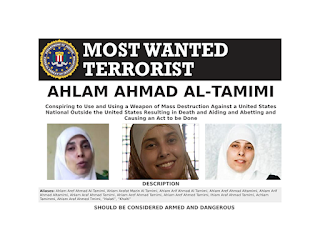 This Ongoing War: A Blog: 14-Mar-19: Two years after Federal charges are unsealed, Ahlam Tamimi remains free. How is this happening? Two years ago today, on March 14, 2017, the United States Department of Justice made an official announcement about the legal status of the woman who for years has boasted of bombing Jerusalem's Sbarro pizzeria and everyone in it. Fifteen people were killed there that hot summer afternoon in 2001. 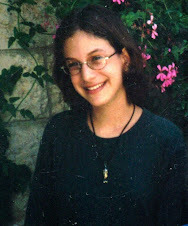 One was our daughter, Malki. A sixteenth victim has been alive but unconscious all these years. Many more people were left maimed with injuries of a hideous nature. Tragedy layered upon tragedy and more tragedy. 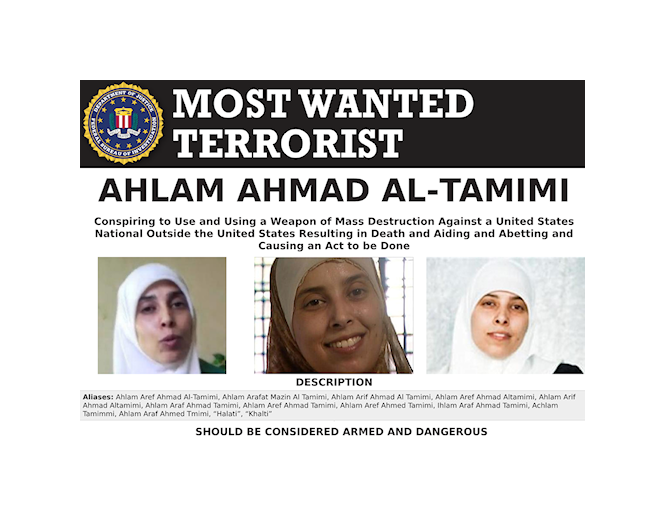 Tamimi, a woman of 21 at the time she carried out the massacre, is Hamas’ first female terror operative. Today she is 39, married (to another convicted and unrepentant murderer), a mother, a Jordanian celebrity, a prominent spokesperson and propagandist for Islamism and jihadist ultra-violence, and a beneficiary of the Palestinian Authority's notorious Pay-to-Slay program. She does not live in hiding and as far as we know never has. Her address is well enough known that she is frequently interviewed by the media; and not only by the Jordanian media or the Arabic media but by respected global news agencies like Associated Press that have sent reporters to her home to interview her on video. Anyone who wanted to take her into custody would have little difficulty finding her. She has boasted publicly, repeatedly and on the record that she had the central role as the mastermind of the massacre. She has claimed credit - while smiling broadly - for the fact that so many of those killed were children. All three of the DOJ officials quoted in the 2017 announcement have moved on to other positions during these past two years. We wrote a letter last week, addressed to them and to the three officials who have taken their places in the DOJ. We asked them whether the DOJ will address certain serious problems that we described for them. We don't plan to publish the letter at this stage, and still hope we will get a meaningful DOJ response that deals with the issues. But we do want people to know (which is why we are posting this to our blog) that we sent that letter and that it asks the DOJ to take some specific steps. A criminal complaint was unsealed today charging Ahlam Aref Ahmad Al-Tamimi, also known as “Khalti” and “Halati,” a Jordanian national in her mid-30s, with conspiring to use a weapon of mass destruction against U.S. nationals outside the U.S., resulting in death. The charge is related to the defendant’s participation in an Aug. 9, 2001, suicide bomb attack at a pizza restaurant in Jerusalem that killed 15 people, including two U.S. nationals. Four other U.S. nationals were among the approximately 122 others injured in the attack. Also unsealed today was a warrant for Al-Tamimi’s arrest and an affidavit in support of the criminal complaint and arrest warrant. The criminal charge had been under seal since July 15, 2013... Two Americans were killed and four injured. an unrepentant terrorist who admitted to her role in a deadly terrorist bombing that injured and killed numerous innocent victims. Two full years, as we said, have passed since the unsealing of the charges against Tamimi. Today is the anniversary. Despite the charges and despite the strong words of US justice officials, she remains at large and a potent voice for more Islamist terror. First, what has not happened: Tamimi is not in custody, not restricted in her movements, not subject to police attention or legal impediment, not pushed to the margins of Jordanian society. She is not on the run. She lives out in the open, free as a bird, living a high profile life from her base in Jordan’s capital city. Her profile continues to become more prominent in Jordanian society. We absolutely agree with those who say she has evolved into a pan-Arab media celebrity and a respected mainstream figure in Jordanian society. Tamimi has never expressed regret. Nor has she in any way denied her key role as the mastermind of the Sbarro pizzeria bombing. We have not found a single instance – not in Jordan, not in any other part of the Arabic-speaking world – where she has been publicly rebuked for her boastfulness over the massacre of innocent Israelis, or even criticized in the mildest way. We have never seen or heard of a single case where Tamimi was criticized or challenged to justify her appalling deeds by an interviewer. She is never contradicted despite her obviously self-aggrandizing exaggerations and her many outright fabrications. She is a hero. Mere days after the March 14, 2017 DOJ announcement, Jordan’s Court of Cassation - the highest court in the kingdom - declared the 22 year old extradition treaty between the US and Jordan invalid under Jordanian law. It found on narrow, highly technical grounds that it was unconstitutional and had been so since the day it was signed during the Clinton Administration. It directed that Tamimi could not be extradited by Jordan. The Jordanian government itself made no public statement of any sort in the wake of the court’s ruling. No intention to prosecute her under Jordanian law or to remedy the alleged procedural defect in the treaty with the US has ever been publicly expressed by any official Jordanian source. It's clear that, unless pressed robustly by its allies, King Abdullah II’s government will simply continue to view the Tamimi chapter as now closed. The official view of the United States, not surprisingly, is that the Jordan/US extradition treaty is and has since 1995 been in full force and effect. The treaty is listed in the authoritative “Treaties in Force” document published by the US State Department and posted online here. The treaty with Jordan appears on page 252 of that listing. Multiple extraditions from Jordan to the US have been requested, and carried out, since the treaty entered into force. Something about a Jordanian calling herself Palestinian bombing a restaurant filled with Jewish children somehow puts the Tamimi case into a different category for the Jordanians. Tamimi serves as a prolific advocate for Arab-on-Israeli terror. Starting in late 2011, immediately after she returned to Jordan from her Israeli prison cell, she traveled widely among the Arab states, addressing enthusiastic audiences with a message blending incitement and vile bigotry. We have tracked her appearances closely. She demonstrates a special interest in focusing on high school and university students. For nearly five years beginning in March 2012, she was the presenter of her own produced-in-Jordan, terrorism-focused weekly TV show beamed globally from Amman to the world. Made under Hamas auspices and beamed to the world via a Hamas satellite TV channel, the toxic program suffered no evident interference from Jordan’s government. It was heavily promoted and its reach was amplified by hundreds of Internet streaming video sites. Tamimi discontinued her frequent traveling outside Jordan’s borders – and ended her central role in that TV show - after being very briefly (for one night) taken into Jordanian police custody on the basis of an Interpol Red Notice request in 2016. At about the same time, she was warned by the Jordanian authorities to lower her profile; it appears she complied, a least for a while. These developments received no publicity at the time they happened. But starting in March 2017, following the court decision that lifted the threat of extradition, Tamimi once again elevated her public profile significantly, once again speaking in public forums, appearing with senior Jordanian politicians including a former Jordanian prime minister. She has made numerous well-publicized speeches, most recently at Jordan’s central Trade Union compound, a venue where meetings of the government itself take place. 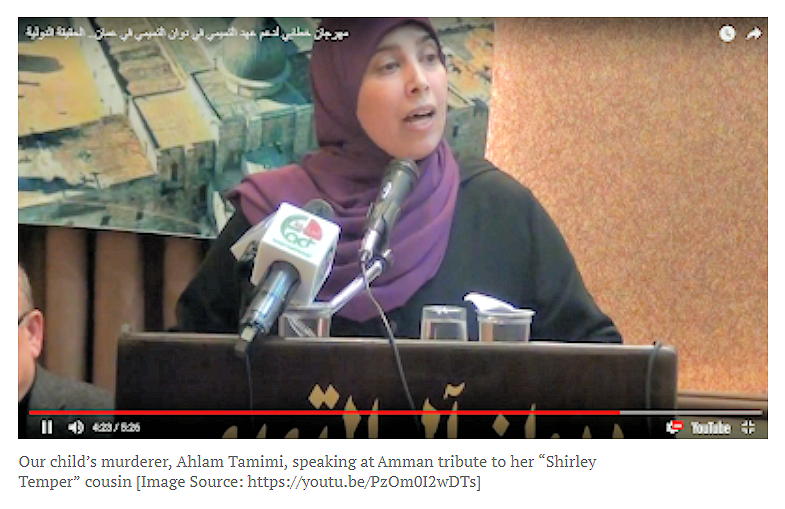 In October 2018, she and her husband received a “This is Your Life”-like tribute on a widely-watched program called “Caravan’, broadcast on Jordan’s highest-rating TV station ["24-Nov-18: How Jordan's mainstream media showcase a couple of role-model jihadist murderers"] After recounting Tamimi’s years in an Israeli prison and subsequent release (but not the murders), the presenter of that prime time Jordanian TV show exclaimed to Tamimi and to the audience: "This is admirable! You, the people of the struggle, elevate the name of Jordan!" It is a tribute that seems consistent with all the other indications we got from the Jordanian media. At the time of the March 2017 DOJ announcements, we learned for the first time that Jordan had already for some years been resisting DOJ efforts to get them to extradite Tamimi to Washington. Within days of the March 2017 announcements and from numerous interactions, it became clear to us that figures within the State Department sought, and continue to seek, to deflect US pressure on Jordan in the Tamimi matter. This has a personal dimension; we see ourselves as being subjected to unacceptable treatment that no one in our position should have to overlook or suffer. It's a deeply unsatisfactory situation and one that exacerbates our ongoing stress and pain as bereaved parents wanting to see the triumphant, admitted murderer of our dearly loved child brought to justice. There are multiple disturbing ways in which Jordan's opposition to the Tamimi extradition is being represented partially and not entirely accurately to the American public and to law-makers. A U.S. criminal complaint was unsealed in March charging Ahlam Aref Ahmad Al-Tamimi, a Jordanian national in her mid-30s, with conspiring to use a weapon of mass destruction against U.S. nationals outside the United States resulting in death. 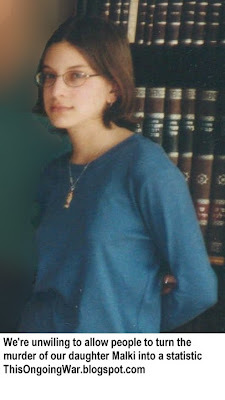 The charge is related to her participation in an August 9, 2001, suicide bomb attack at a restaurant in Jerusalem that killed 15 people, including two U.S. nationals. Four other U.S. nationals were among the approximately 122 others injured in the attack. Also unsealed was a warrant for Al-Tamimi’s arrest and an affidavit in support of the criminal complaint and arrest warrant. Jordan’s courts have ruled that their constitution forbids the extradition of Jordanian nationals. That last sentence is astounding; it's also quite revealing. Why does this important State Department report to Congress not go on to explain, which is certainly the case, that while Jordan says it's invalid, the US says the exact opposite. The US says the 1995 Jordan/US Extradition Treaty is fully in effect. Isn't that worth noting in a report to Congress? Shouldn't they at least say the US does not agree with Jordan? And that the US believes Jordan is wrong? Tamimi has become an iconic figure, a person of huge influence in a region where terrorism is a daily and manifest threat to public stability. She lives a life to which no one with a violent history of savagery like hers should ever be entitled. And while we believe in the importance of a peace-oriented strategic relationship with Jordan and its ruler, we also believe in the central and pre-eminent role of justice. We continue to hope we will still see it in the case of our child’s killer.